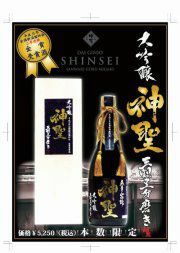 We are proud to introduce to our most discriminating clientele our newest sake, Shinsei Daiginjo, winner of the Gold Medal at the National New Sake Awards. To make this premium award-winning sake, we start with Yamada Nishiki rice, which we mill down to 35% before adding just the perfect amount of distilled alcohol to bring out the maximum flavor and crispness. This delectable nectar combines the sweet fragrance of the Yamada Nishiki rice with the exquisite taste of a full bodied Daiginjo and a crisp finish at the end.